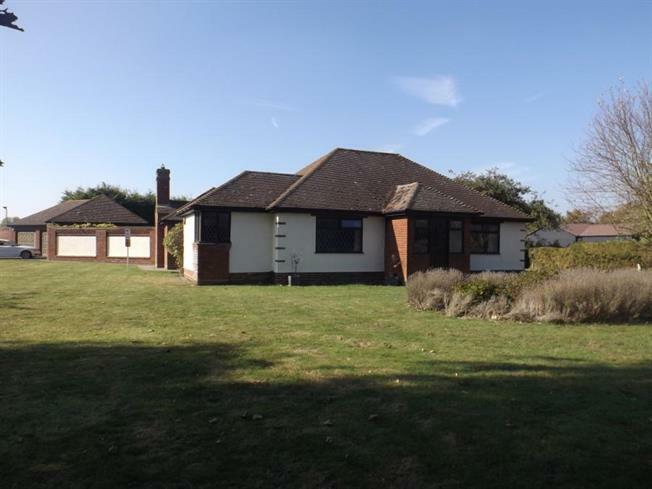 4 Bedroom Detached Bungalow For Sale in Colchester for £700,000. This unique bungalow is offered for sale with no onward chain. The accommodation comprises of four double bedrooms, one of which has an en-suite shower room and a dressing room, an open plan kitchen diner, lounge, utility room, family bathroom and separate WC. There is a double garage attached to a versatile room, previously used as a gym and contains a sauna. The property is situated on a generous plot giving you gardens to the front and the rear of the property, where there is a heated swimming pool. The property has been done to a high standard and benefits from granite work tops in the kitchen, granite flooring and marble tiles in the bathrooms. The property is deceptively spacious so viewing is a must to fully appreciate the accommodation on offer. Double glazed windows to the side aspect, double glazed french doors to the side aspect, leading to the garden. Gas fireplace, built in speakers. Selection of wall and base mounted units with a granite work surface and an insert sink and drainer, integrated microwave, oven and hobs. Double glazed window to the side aspect, double glazed French doors to the rear, leading to the garden. Single door down a smaller hall, to the side aspect leading to the front garden, skylight. Selection of wall and base mounted units with a granite work surface, butler sink. Space for a washing machine, tumble dryer and a fridge/freezer. Double glazed window to the front and rear aspect, double glazed door to the rear aspect leading to the garden. Built in storage cupboards. Marble tiles on the walls, granite floor tiles, bath with central mixer tap, WC, sink, wall mounted radiator. Skiylight. Marble tiles on the walls, granite floor tiles, WC, wash hand basin. Double glazed window to the front, sauna with wooden seating measuring 6'03" x 6'03"
Two electric garage doors to the front, electric garage door to the rear, double glazed door to the rear. The mature rear garden has a grey patio area surrounding a heated swimming pool which is approximately 40ft x 15ft. the depth is 6'9" reducing to 3ft 6" where there are steps leading in to the pool. The rear garden is fully enclosed with brick walls and fence boundaries and two gates, one to the side and one to the front. The front garden is open to the side, leading to a shared access driveway that has electric gates from the road. The remainder is enclosed with hedges and trees.